During the month of January, citrus fruits are excellent and it is good to use them as much as possible in the kitchen not only as a fruit. This way we can make lighter dishes that are tasty and contain a good supply of vitamin C. This recipe uses oranges for a preparation of the fish. It’s a recipe found in a magazine 20 years ago that I reworked introducing buckwheat and spelt (farro) flour. It is very fast and an excellent preparation. In a sautee pan toast the almonds turning them until they are golden. Remove them from the pan and keep aside. Wash sole fillets and drain but do not dry them. Wash the lettuce Belgian cut in half by removing the inner core. Then cut into strips and place in a bowl. Wash and slice thinly slice the oranges along with their peel. Mix them with the endive. Season with salt and pepper and two tablespoons of olive oil. Mix the two flours in a large dish, flour the fillets. In the pan pour 4 tablespoons of olive oil. When hot, sautee the fillets 5 minutes per side, add salt and pepper to taste, pour in the orange juice and after 1 minute, add the cream in which you have added the Worcester sauce. 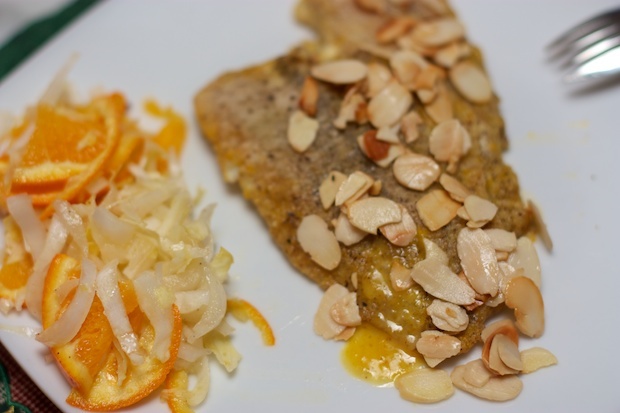 Place two fillets on each plate with a little sauce and toasted almonds, then place a little bit of the orange salad on the side.